Today I found out Elizabeth Taylor was at one time Carrie Fisher’s step-mother. Carrie Fisher, who’s best known for her role as Princess Leia in Star Wars, is the daughter of famed entertainers Eddie Fisher and Debbie Reynolds. At the height of Eddie Fisher’s fame as a singer and eventual TV show host in the 1950s, he married actress Debbie Reynolds, with the two staying married for four years, from 1955-1959. Carrie Fisher was born just a year after the two were wed in 1956. 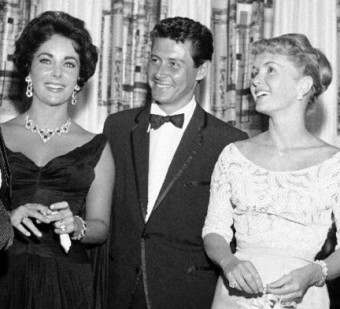 When Eddie Fisher divorced Reynolds in 1959, he quickly married one of Reynolds’ best friends, Elizabeth Taylor who was also the widow of his former best friend, producer Mike Todd, who had died in 1958. After Todd’s death, Fisher and Taylor became close and began having an affair that ultimate resulted in him divorcing Reynolds. The marriage with Fisher was surprisingly Elizabeth Taylor’s fourth marriage, even though she was at the time only 27 years old. The two stayed married for five years and divorced in 1964 when Carrie Fisher was 9 years of age. From there, Fisher married three more women throughout his life (making a total of five), two of which he later divorced and one that died in 2001 while the two were still married, that one being his longest marriage, lasting nearly nine years. Elizabeth Taylor went on to marry another four men (making a total of seven husbands and eight marriages). Her final husband was Larry Fortensky who was a construction worker she met at the Betty Ford Clinic. Interestingly, despite the fact that Reynolds’ husband left her for Elizabeth Taylor, the two women eventually became friends once again, after, by chance, they were traveling together on a cruise liner and decided to make up. They also did a made for TV movie together called These Old Broads where a bit in the movie includes the two making fun of a character named “Freddie” who was the ex-husband the two characters had both at one point been married to. 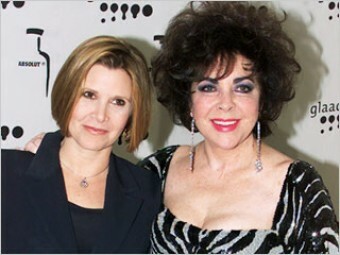 Incidentally, These Old Broads was co-written and produced by Carrie Fisher. Carrie Fisher began performing with her mother, Debbie Reynolds, at just 12 years old in Las Vegas, including eventually performing in the Broadway show Irene in 1973, which starred Debbie Reynolds. The famous golden bikini in Return of the Jedi was originally thought up as Fisher had complained in A New Hope and Empire Strikes Back that her outfits made it so the audience couldn’t tell by anything but her face and voice that she was a woman. Fisher stated that it wasn’t actually made of metal, but rather a type of plastic. Further, from behind, the outfit left absolutely nothing to the imagination, in her words: “if you stood behind me, you could see straight to Florida.” She also stated she had some issues keeping her top from falling off at times, which also added to her uncomfortableness on the set, despite the fact that everyone was completely professionally even though she was half naked. Carrie Fisher is indirectly mentioned in several Paul Simon songs, with the two having been married for a year in 1983-1984 and having dated for about five years before that. During filming of Empire Strikes Back, Carrie Fisher has stated she used cocaine heavily and nearly died of an overdose at one point. The famous “bun” hair style worn by Leia in A New Hope and later by Padme in Revenge of the Sith was inspired by a certain Mexican hair style that was popular in the late 19th century. Somewhat similar hair styles can still be seen sometimes in places like Valencia Venezuela, particularly during the Falles festival. In the original A New Hope script, Leia was to be a 14 year old spoiled princess with two brothers, neither of which was Luke. In the original Empire Strikes Back script Darth Vader was not Luke’s father, but rather his father appeared to him in ghost form, much like Obi-wan in the final script, and instructed him in the ways of the Jedi. The co-writer of that script died of cancer though, and Lucas was unhappy with it anyways, so re-wrote parts of it, including making Vader Luke’s father. He also decided to write in the scene having Han Solo imprisoned in carbonite to make the ending even darker. Lucas originally envisioned Star Wars as a nine part movie series, but after doing the middle three, he became sick of it and decided he’d abandon the franchise, though he later went back on that and made the first three. Hopefully if he decides to make 6-9, he’ll go with the Timothy Zahn “Heir to the Empire” trilogy, which is fantastic, and not try to write his own scripts again after the disaster, particularly with the dialogue, that was 1-3. Interestingly, in the original plot of Revenge of the Sith, Lucas had Anakin’s journey towards the dark side be because the Emperor had poisoned his mind against the Jedi and convinced him that the Jedi were attempting to take over the Republic and were themselves the ones who were secretly evil. Thus, Anakin joined the Emperor to prevent that. He later changed it so that Anakin becoming a Sith Lord was simply to try to save Padme’s life, which, in my opinion, is a much weaker plot than the original. Eddie Fisher died just a little over a year ago on September 22, 2010, from complications after falling and breaking his hip just 13 days before his death. Elizabeth Taylor died on March 23, of this year (2011) of heart failure, six months after Eddie Fisher. Debbie Reynolds also partook in serial monogamy marrying three times: to Eddie Fisher, then shoe store chain owner and millionaire Harry Karl, who ultimately gambled away his and her fortune, and finally to Richard Hamlett from 1984-1996. The final marriage fell apart reportedly due to problems with a hotel and casino the two owned in Las Vegas that was floundering and eventually went under a year after their divorce, resulting in Reynolds having to declare bankruptcy. Today, Reynolds lives next door to her daughter, Carrie Fisher, in Beverley Hills. Debbie Reynolds got her start as an entertainer at the age of just 16 years old, signing on with Warner Bros. and later with MGM. She was vaulted into stardom four years later for her role in the musical Singing in the Rain. Elizabeth Taylor was actually born in Brittan, but with U.S. parents, giving her dual citizenship. Her godfather was British parliament member Colonel Victor Cazalet. She tried at one point in the 1960s to renounce her U.S. citizenship and became solely a British citizen, but her request was denied because she wouldn’t speak the words that she renounced all allegiance to the U.S.
Taylor’s family moved back to the U.S. when WWII broke out. She subsequently began acting at the tender age of nine years old. She became a star just three years later at the age of 12 after appearing in the movie National Velvet, which also stared Mickey Rooney and Angela Lansbury. Due to devoting all her time to acting and practicing acting, Taylor received little formal education and even in her teen years reportedly couldn’t add or subtract well without using her fingers. She even attempted to quit acting so she could just enjoy being a kid, but her parents refused to let her. Taylor’s first marriage was to Hilton heir Nicky Hilton, who turned out to be extremely abusive and had gambling and drinking problems, so the marriage only lasted about 6 months. She was just 18 years old when the two got married. Her second marriage was to a much nicer man, Michael Wilding, but who was 20 years older than her, which ultimate doomed the marriage, according to Taylor, because of her immaturity. Her third marriage was to producer Michael Todd and lasted a little over a year before he died. Her forth marriage was to Eddie Fisher. Her fifth was to “one of the three loves” of her life, famed actor Richard Burton. The two began having an affair with one another while they were both married to other people. Her sixth marriage was also to Burton, the two divorced and later got back together. Her seventh marriage was to U.S. senator John Warner, which ended with her being deeply depressed and unhappy with the life of a politician’s wife. She checked into the Betty Ford Clinic, which was also where she later (a different instance) met her eighth husband Larry Fortensky, who was at the clinic due to drunk driving and a general drinking problem. The two got married in 1991 and divorced in 1996. Incidentally, their prenuptial agreement stated he had to stay married at least five years to get anything in the divorce. On the five year mark, almost exactly (about 24 days after the mark), they got divorced and he received one million dollars. The two remained friends though throughout the rest of Taylor’s life and she occasionally gave him additional funds to help him support himself. She also left him an additional $800,000 when she died. According to Fortensky’s sister, the two did not divorce for lack of love, but rather because he was sick of being known as “Mr. Elizabeth Taylor”. Taylor also was engaged to be married to Glenn Davis, the Heisman Trophy winner. More famously, Howard Hughes attempted to get Taylor to marry him, even trying to get her parents to convince her. He promised to build a movie studio for her, if she’d marry him. When Hughes proposed to Elizabeth Taylor, he swooped in with a helicopter and had it sprinkle diamonds all around her. While married to Burton, Elizabeth Taylor intentionally gained weight to try to get studios to stop giving her movie roles as she once again attempted to quit acting. Upon her death, Elizabeth Taylor’s estate was estimated to be worth around $1 billion, including $150 million worth of jewelry and $130 million in real estate. Interestingly, most of her fortune did not come from acting, but from her various business dealings. In 2010 alone, her various business ventures grossed nearly $70 million. Throughout her life, Taylor was hospitalized 70 different times and had 20 major operations, among these included: having both her hips replaced, breaking her back five times, surgery to remove a brain tumor, surgery to repair a punctured esophagus, heart surgery, and skin cancer. At her funeral, Taylor requested that she be late for her own funeral, so it was started 15 minutes after the posted time.